This cocktail recipe literally says "Merry Christmas" and it's a delightful drink that's sure to put you in a festive mood. You'll love how easy it is to mix up, making it a great choice for holiday parties and it's a perfectly refreshing option for dinner. The Merry Christmas cocktail features cranberry, one of the best fruits of the winter season. The spirit of choice is Plymouth Gin, an aromatic gin that has a hint of fruitiness, making it a perfect match for the cranberry juice. Club soda makes up the majority of the drink, so it's a quick low-proof cocktail that's more like a gently spiked, fruity soda. Pour the gin and juices into a collins glass filled with ice. Top with club soda and garnish with a few cranberries. Adjust the ratio of the ingredients to suit your taste. For instance, you might enjoy a full shot (1 1/2 ounces) of gin and 2 ounces of juice with less soda. There's no need to be exact and measure out 1 teaspoon of lemon juice. The easiest approach is to cut a lemon wedge, then squeeze the juice from that into the shaker. 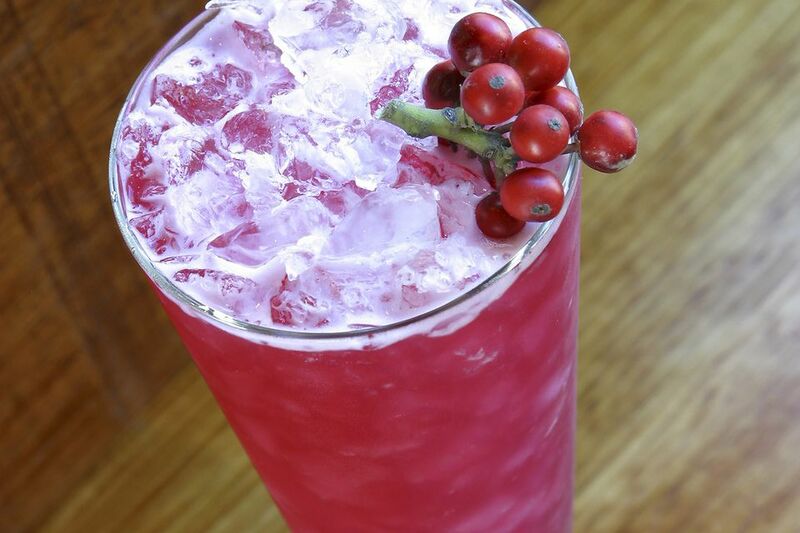 Fresh cranberries definitely make a prettier garnish than the dried variety. Dried cranberries look like raisins and do not float. Luckily, the fresh fruit is typically still in season around the December holidays. Pour any other style of gin that you like. Plymouth is unique and it pairs very well with fruits, but it's not your only option. Try it with your favorite dry gin or explore some of the newer styles that do not have such a pronounced juniper flavor. You can also pour almost any base liquor instead of gin. If you have a preference for rum, vodka, or whiskey, try it in this recipe. All of them pair nicely with cranberry. If you skip the gin, you have a nice nonalcoholic alternative for anyone who doesn't drink. As an alternative garnish, a long lemon twist or a sprig of mint will dress up the drink nicely. You can even add a cinnamon stick, which will infuse the spice into the drink and doubles as a stir stick. Try this cocktail with a fruit juice blend like cranberry-pomegranate as well. The two fruits are popular for winter drinks and taste excellent together. Another option is to add 1 ounce of a pomegranate liqueur like Pama. How Strong Is a Merry Christmas Cocktail? If you're worried about drunken holiday blunders at your party, the Merry Christmas cocktail is a great choice because it's an extremely light cocktail. Though its alcohol content will vary slightly, this drink should mix up to somewhere around 5 percent ABV (10 proof), so it's a lot like drinking a beer.